Inventory We are a resale marketplace, not a box office or venue. Ticket prices may exceed face value. This site is not owned by Enterprise Center . 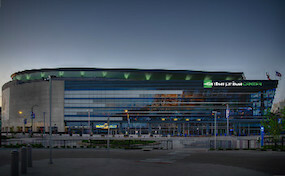 Enterprise Center (formerly Kiel Center, Savvis Center, and Scottrade) is a 19,150 seat arena located in downtown St. Louis, Missouri, opened in 1994. It is the home of the St. Louis Blues of the National Hockey League. Enterprise Center is respected as one of the louder NHL arenas due to several factors including the 9-second foghorn blast after every Blues' goal followed by an organ rendition of "When the Saints Go Marching In". Besides ice hockey, the arena features a range of arena programming, including professional wrestling, concerts, ice shows, family shows, and other sporting events. It hosts approximately 175 events per year, drawing nearly two million guests annually. For the first quarter 2006, Enterprise Center ranked second among arenas in the United States and fourth worldwide in tickets sold. Industry trade publication Pollstar ranks Enterprise Center among the top ten arenas worldwide in tickets sold to non-team events. CenterStLouis.com is an independently owned and operated company that concentrates solely in the online resale of all events in the seconday ticket market. We are not currently affiliated with any primary box office, venue, and or official website. Prices on our sites tend to be above face value and will change quickly with market demand. To purchase tickets to all Enterprise Center St Louis events please follow the steps online through checkout.